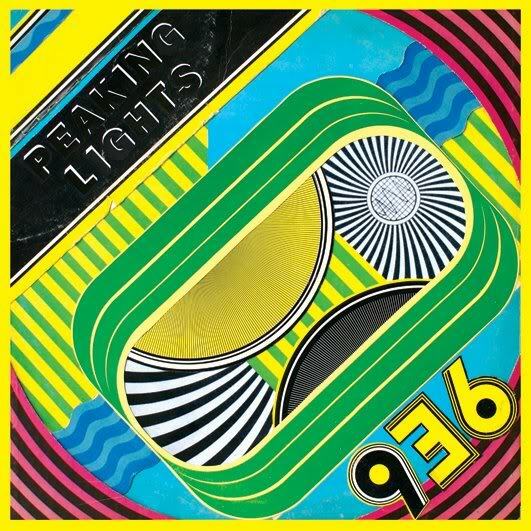 Hailing from Madison, Wisconsin, husband and wife duo, Peaking Lights, make sun-speckled dub pop psychedelia. The premise is simple: deep repetitive bass, catchy drum loops, extended grooves, and ethereal vocals that also work on repetition and cavernous echo. The result: a perfectly blissed-out album for the summer months, one that will linger in your head long after the album’s played out. Since the duo spent some time in California and record on the intriguing Not Not Fun label, an immediate comparison can be to fellow labelmate Sun Araw, who operates in the same hypnotic manner, but while “936” leans heavily on reggae and dub influence for groove, it also pays homage to lo-fi psychedelic rock, and even though the tracks on “936” are deep and sludgy, they still manage to feel open and airy. The songs wander, joyfully going nowhere in particular for up eight minutes, and you’ll be right there with them, bobbing your head and grinning. While not too far away compositionally from many dub techno artists like Rhythm and Sound or Deadbeat, Peaking Lights style diverges, because instead of going inward they go out – it’s still heady music, but as their name implies, they take the listener up up up, floating in a headspace above the clouds and the mountain peaks, a place where just enough light and warmth peeks through to make you smile. With “936”, Peaking Lights creates groovy yet subtly romantic music that allows the listener to cheerfully zone out, whilst also playing with the notion of summer nostalgia, and the result is surprisingly radiant. Check it. This entry was posted on July 15, 2011 at 11:34 and is filed under electronica, music. You can follow any responses to this entry through the RSS 2.0 feed. You can leave a response, or trackback from your own site.